How do we optimize our diet for total brain function? What are the best diets for the brain and cognitive function? How much does diet influence our sensorium? What particular foods are important? How do we change our genes to optimize our brain? Sensorium is the total brain capacity for focusing, processing, and interpreting. It is not a static state—it can fluctuate throughout the day. It can be influenced by sleep, food, stress, exercise, drugs, medications, and long term, through epigenetic phenomenon. If there is damage to the structure of the brain, it can permanently lowered. It is a slope, which we all move up and down on, based on our baseline, but then also influenced by many factors. Figure 1: Line representing how sensorium (total brain function) changes based on positive and negative influences. In your 20s and 30s you are very far on the left side of the line. If you get stressed, sleep deprived, starving, maybe have a small infection, you may still be able to think, but just less clearly. If you did those same things to an elderly person, they would be sent into a full delirium, hallucinating, throwing things, yelling, seeing spiders on the wall, and looking psychotic. In this way it is common for an elderly person with dementia, they can be more confused in the evening then in the morning, they call this “sundowning”. We all have a baseline level of brain function, and this can be optimized by several factors like good sleep, good amounts of exercise, good mental functions (like reading), meaningful relationships, good spiritual practice, and meaningful work. We can also lower our sensorium through certain drugs, excessive alcohol, significant medical issues, poor sleep, poor diet, unrelenting stress, and untreated medical issues (like out of control diabetes or obstructive sleep apnea without treatment). This applies directly to psychiatry, because we want to think about how to make our patients the most functional human beings possible, with the highest sensorium, so they can engage in meaningful work and life. This applies directly to psychotherapy, because the chance of significant work taking place in psychotherapy will be lower if your patient is confused, and unable to integrate new memories and new ways of processing information. I am going to go through some of the science of how sensorium is lowered or strengthened. I am going to hit the categories briefly and in future episodes go through them in more detail. We will start with what delirium is—very, very poor sensorium. This led me to be curious about how to optimize sensorium, both in how to decrease dives in sensorium, and also how to increase it long term. I wanted to present this topic early in my podcast because it is a way that I think about psychiatry and psychotherapy and influences many of my decisions. First, I will go into 3 stories, which illustrate the power of treating someone with sensorium in mind. I will change the demographic information to protect their identities. Jake was a 60 year old man who came into my clinic after being on disability for 10 years. He had lost his daughter, which still weighed heavily on him. He used to be a business executive, having run several companies with over two hundred employees. He was an expert at turning around dysfunctional companies that were about to fail, even to the point of needing to let go of all their staff and facing shutting down. At a certain point 10 years ago he had had a head injury, with loss of consciousness for greater than one hour. He had needed to be hospitalized afterwards. He was put on pain medications and muscle relaxants, and was subsequently unable to control his anger, flying into fits of rage, throwing things, yelling at staff and acting ways that got him fired. Afterwards, Jake ended up on chronic disability with little hope of working again. Jake had a hard time reading books like he had before, and had general issues with focusing and completing tasks. In my initial assessment, I focused on giving him hope that I thought he could optimize his brain function and improve his sensorium. We started an intensive outpatient program to help him overcome the loss of his daughter, and so I could manage his medication closely. I tapered him off his opioids, benzodiazepine, and baclofen (a muscle relaxant that is centrally acting). We also worked on optimizing positive things, like doing strength and cardiovascular exercise, and diet changes. His concentration returned; he was able to work through his grief, and after the intensive outpatient program we focused each session we had on re-launching his life. He eventually was able to get a position as a CEO of a big company, and within months the profits were up at the company and he was able to do meaningful work. Another example is a middle aged woman who worked as a therapist. Beth was having issues with memory and reading things. She always felt like she was in a fog. She had a difficult time with keeping her schedule and was frequently missing things. She was worried she might be having dementia. We did several exercises, including helping her give up her chronic anger she had towards an ex. We switched her migraine medication from 2 things that lower sensorium (topiramate and an anticholinergic amitriptyline) to another medications which does not lower sensorium (Cymbalta). We also did some lifestyle changes, like 4 days per week of exercise and eating more healthy food. Her memory and focus came back and she once again found her work meaningful and pleasurable. Tom was a man in his mid 40s who could not focus and felt like he was depressed. He came to me wanting ADHD medication and something for depression. But on further history he had no history of ADHD in childhood, but only in the last 4 years. He had gained weight into his 30s and 40s and was over 300 pounds. He would wake up with headaches, and he had out of control type 2 diabetes. He ate fast food and drank alcohol 3-4 times per week, usually 3-4 servings per night. I was concerned he had sleep apnea, which he did, and we got him started on wearing a sleep mask and losing some weight for a long term solution. We cut out soda, fast food, and other non-healthy foods. I had Tom focus on working through his marriage conflicts, and his chronic stress from work also decreased with some therapy. Over the course of 2 years, he lost 50 pounds. His diabetes was under better control. He was also able to increase his strength through strength training. He doubled his strength and now is able to decrease his medications he used for diabetes to only metformin. He had also stopped drinking alcohol, except for maybe one drink per week. He would meal prep and was eating high quality food, mostly in line with a mediterranean diet. He said his focus was the best it had ever been and felt purpose and meaning in his work and life. His relationship had also improved and he enjoyed time with his kids and wife. The issue is not stress, but rather stress beyond our scope of comprehending it, like near death experiences and also chronic stress which never resolves. Trauma needs to be visited in a way that can be processed and catabolized. You need to re-experience aspects of the trauma, but in a new way, with a trusted connected person. In part 2, I will go through more details on things that increase or decrease sensorium. Ahmed, S., Leurent, B., & Sampson, E. L. (2014). Risk factors for incident delirium among older people in acute hospital medical units: a systematic review and meta-analysis. Age and ageing, 43(3), 326-333. Laurila, J. V., Laakkonen, M. L., Laurila, J. V., Timo, S. E., & Reijo, T. S. (2008). 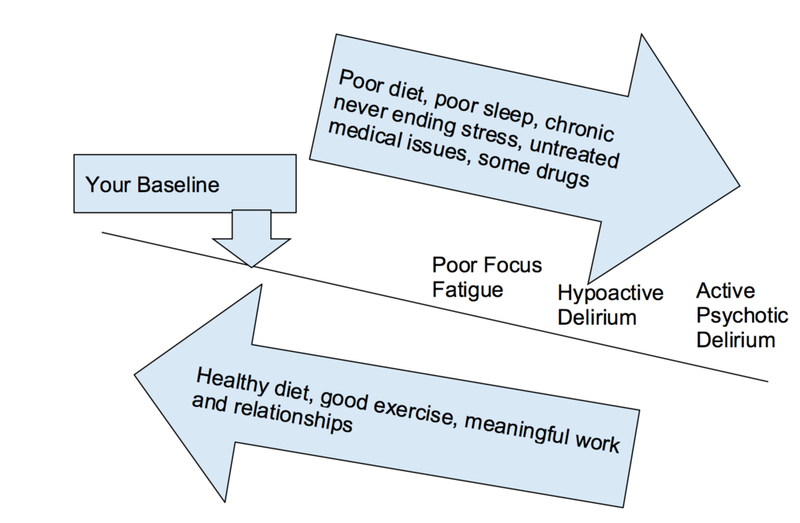 Predisposing and precipitating factors for delirium in a frail geriatric population. Journal of psychosomatic research, 65(3), 249-254. Pisani, M. A., Murphy, T. E., Araujo, K. L., Slattum, P., Van Ness, P. H., & Inouye, S. K. (2009). Benzodiazepine and opioid use and the duration of ICU delirium in an older population. Critical care medicine, 37(1), 177. McLaughlin, K. J., Gomez, J. L., Baran, S. E., & Conrad, C. D. (2007). The effects of chronic stress on hippocampal morphology and function: an evaluation of chronic restraint paradigms. Brain research, 1161, 56-64.